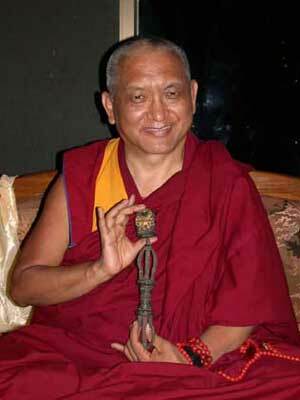 Lama Zopa Rinpoche gave this teaching at Aryatara Institute, Germany, 7 April 2001. Every one of us has universal responsibility. If you have a good heart, loving kindness-compassion, then in your daily life, numberless living beings, including the people around you, animals, insects, in fact, all other living beings, do not receive harm from you. If you develop a good heart, loving kindness-compassion, not only do other sentient beings not receive harm from you, they also receive benefit and help. That absence of harm means peace and happiness in this life, happiness in all the coming future lives, and the ultimate benefit of bringing all sentient beings into total liberation from the entire ocean of samsaric sufferings by ceasing its cause, delusion and the karma. Not only that, but by having compassion, you benefit numberless other sentient beings by bringing them into great liberation, the non-abiding sorrowless state of full enlightenment, which is total cessation of not only the gross, but even the subtle mistakes of mind, the subtle defilements; the subtle negative imprints left by the disturbing thought, the simultaneously-born ignorance, grasping at the I, the aggregates and all other phenomena as inherently existent, the subtle negative imprint that projects the hallucination, the dual view, of inherently-existent appearances. The cessation of all this is the great liberation. Thus, by developing compassion, you collect extensive merit, and through that you are also able to develop wisdom and cease all the defilements. In this way, you are able to bring all sentient beings into the peerless happiness of full enlightenment. Thus, you can see how you can bring all these various levels of happiness to other sentient beings. So whether or not numberless sentient beings receive all this happiness from you is in your own hands; it depends upon what you do with your mind. It’s up to what you do with your mind—whether you generate the good heart, loving kindness-compassion, towards all the sentient beings or not. Therefore, every one of us has complete responsibility for all the happiness of sentient beings from this life’s temporary happiness up to that of full enlightenment. Fulfilling this responsibility to bring happiness and benefit to other sentient beings is the purpose of your life, the reason you are alive. In order to liberate the numberless sentient beings from all their suffering and its cause, and bring them all happiness up to that of full enlightenment; to accomplish such perfect work for all sentient beings, first you need to achieve full enlightenment yourself. In order to be able to heal all the sicknesses of others, to give them the happiness of freedom from disease, you need to be a fully qualified doctor, knowing how to diagnose illness and what all the various treatments are. In the same way, then, to free others from all suffering and its cause and lead them to the peerless happiness of enlightenment, first you need to become fully enlightened yourself. Of course, getting enlightened doesn’t happen without cause—you have to actualize the path to enlightenment. Therefore, without creating the cause, completing the general path, you cannot achieve enlightenment. Also, the path you actualize has to be an unmistaken path; if it’s a mistaken path, you cannot achieve enlightenment. Furthermore, you have to complete that unmistaken path. Just having a few realizations isn’t enough for you to achieve enlightenment. You have to complete all the realizations of the path to enlightenment. Now, achieving full enlightenment depends on actualizing the graduated path of the being of greatest capacity. That depends on actualizing, as a preliminary, the path of the being of intermediate capacity and the common graduated path. And that depends on actualizing, as a preliminary, the path of the being of lowest capacity and the common graduated path. Success from the beginning of the path—the graduated path shared in common with the being of least capacity, which starts with realization of the perfect human rebirth, this precious human body qualified by eight freedom and ten richnesses—all the way up to the end, enlightenment, depends on the root of the path to enlightenment, first analyzing prospective gurus and, having found the right one, correctly devoting yourself to him through thought and action. In his commentary to the Fifty Verses of Guru Devotion, Lama Tsongkhapa explained the different qualities of the guru according to the various teachings he quotes (see The Fulfillment of All Hopes, Wisdom Publications, 1999, p. 41 ff. See also Geshe Ngawang Dhargye’s commentary here: http://www.lamayeshe.com/otherteachers/dhargyey/index.shtml). According to one explanation, the guru should  have stable devotion in the Mahayana teachings,  be learned in the different levels of the teachings—the Lesser Vehicle, Paramitayana and tantra— be skillful and wise in guiding disciples along the path to enlightenment,  have strong compassion for others and  be subdued in his three doors of body, speech and mind. One set of five qualities is explained like that. Then, in his Mahayanasutralamkarakarika, Maitreya Buddha explained the ten qualities of a Mahayana guru. The first three he mentioned were having his three doors  subdued,  pacified and  highly pacified. The first one means the higher training in morality—abstaining from vice, protecting himself from creating negative karma. The second one, pacified, means having controlled his mind, his disturbing thoughts, through having developed shamatha, the realization of calm abiding; in other words, having the higher training in concentration. The third one, highly pacified, means having the realization of great insight, emptiness; the higher training in wisdom. The fourth of the ten qualities is  having greater knowledge and higher qualities than the disciple. He should also  have perseverance and  his holy mind should be enriched with scriptural understanding and the lineage of the teachings. He should  have realized emptiness. Even though this realization has already been mentioned as the third quality, here it specifically means having the realization of emptiness according to the view of the Prasangika, the highest of the four schools of Buddhist philosophy. The previous mention of great insight meant the realization of emptiness according to any of the Buddhist schools; here it means specifically the Prasangika view. The remaining three qualities are  skill in explaining Dharma,  compassion for the students and  never feeling too discouraged or upset to explain Dharma, to guide and benefit the disciples. Anyway, if there’s strong compassion, there’s no way a mind feeling lazy or too tired to guide the disciples can arise. Also, as it is mentioned in the Guru Puja (Lama Chöpa) and other texts, there are further qualities of the guru who reveals the tantric teachings—the ten outer qualities of the guru who teaches the lower tantras and the ten inner qualities of the guru who teaches Highest Yoga Tantra. However, the very essence of all these qualities is that the guru should emphasize cherishing others. If the guru does not exhort the students to cherish others, it becomes an obstacle to their developing a good heart and actualizing bodhicitta, the realization required to enter the Mahayana path to enlightenment. But if the guru does not emphasize that, at least he should emphasize liberation from samsara, attainment of ultimate, everlasting happiness. And if not that, at the very least he should emphasize that the happiness of future lives is more important than the happiness this life. That is the very bottom line—it is more important to work for happiness of future lives than for the happiness of this life. If the teacher does not emphasize this, the disciples’ attitude for practicing Dharma will not become Dharma. Whatever they do—meditation, retreat, any other activity—there’s danger that they will waste their whole life. Whatever they do will not become Dharma, will not become virtue. Everything they do will be done with pure attachment, pure non-virtue, seeking only happiness of this life. Whatever the student does—meditation, prayer, all twenty-four hours’ activities—becomes non-virtue, negative karma. That’s the danger of having a guru who does not teach the importance of working more for future lives than this. You can waste your entire life if your teacher doesn’t emphasize detachment from the pleasures of this life and to work for long-run happiness, the happiness of all the coming future lives; not just one future life’s happiness but that of all future lives. So, whether the teacher is ordained or lay, the very essence is who emphasizes these things, especially bodhicitta. In that way, the teacher is able to bring the disciple to enlightenment. By emphasizing liberation from samsara, the teacher can bring the disciple to liberation. By emphasizing letting go of attachment, not clinging to this life, and emphasizing to work for happiness of all the coming future lives, the teacher allows the disciple to achieve happiness in future lives. This is how various teachers guide their disciples. The other fundamental quality that a teacher needs is to emphasize ethics, morality. In that way, the teacher is able to guide the disciple away from negative karma and protect the disciple from creating negative karma, the main obstacle to achieving enlightenment, liberation from samsara and the happiness of future lives. It is important, therefore, at the beginning, before making a Dharma connection with a teacher, to analyze that person well. After thinking well, then establish a Dharma connection. The tantric teachings explain that in degenerate times such as these, it is difficult to find a teacher that has all the qualities as they are explained in the teachings. If that is so, still, your teacher should have eight of them, or five, or at least four. At least the teacher should possess the basic qualities that I mentioned before. This will help you avoid trouble in future, avoid creating very heavy negative karma, such as rising heresy, anger, many negative thoughts, and also, after having made a connection, giving up. Checking carefully will help you avoid all these dangers. The holy mind of all the buddhas, the Dharmakaya, the transcendent wisdom of non-dual bliss and void, which is eternal, which has neither beginning nor end, which pervades all existence—that is the real meaning of guru. When you think of your guru, when you visualize your guru, when you see your guru, when you hear you guru, this is what we should come into your heart and mind. When, in your daily life, you see, hear, visualize or remember your guru, the real meaning, or understanding, should come into your heart. The word is guru, but the real meaning is that. When you have a stable realization of guru devotion, always in your heart, your recognition of guru is that. From the side of the disciple who has a stable realization of guru devotion, when you see or think of Buddha, it’s your guru. There’s no other Buddha; there’s no Buddha separate from your guru. You don’t see that. Your realization is the oneness of guru and Buddha. Even when you visualize yourself as Buddha, it’s guru. Because you’re the deity, the guru. Even when you visualize the deity in front of you, it’s the guru. This understanding is in your heart. Even when you see statues and thangkas, you think, “My guru has manifested in these forms to allow me to purify my mind and collect merit.” Also, this is such an easy way of purifying and creating merit. It does not depend on your generating virtuous motivation; it happens without your mind becoming Dharma. Even if your motivation is not Dharma, just by seeing, circumambulating, prostrating to, making offering to these holy objects, immediately your actions become the cause of enlightenment, liberation from samsara, happiness for hundreds of thousands of future lives. If that’s so, then there’s no question that that powerful merit also affects this life. Since you purify so much negative karma, of course it reduces the problems of this life—relationship problems, sicknesses, cancer; all such things. However, simply by existing, these holy objects make it so easy for us sentient beings to create merit and purify our minds. With most other activities, first we have to put great much effort into making our minds Dharma — pure, unstained by ignorance and attachment and, in particular, the self-cherishing thought. Only after we make a great effort can our actions become virtue and result in happiness. In that way, we have to work hard for happiness. But the existence of holy objects makes it easy for us sentient beings to purify our heavy negative karmas and collect extensive merit, creating the space in our mind that enables us to gain the realizations of the path to enlightenment. The thing to understand or realize here is that all these holy objects exist through the kindness of the guru. That they make it so easy to purify negative karma and defilements, gain realizations and freedom from the ocean of samsaric suffering and achieve enlightenment is due to the kindness of the guru manifesting in this way. You can understanding or realize this by understanding that the meaning of the guru is Dharmakaya, the holy mind of all the buddhas—all these holy objects happened through the kindness of guru manifesting in these aspects to liberate you from samsara and bring you to enlightenment. If the absolute guru, the Dharmakaya, all the buddhas’ holy mind, manifests in an aspect more pure than I am able to see, in an aspect more pure than my karma allows me to see, I cannot see that aspect until I make my mind purer than it now is. At present, your mind is so heavily obscured that even though Guru Shakyamuni Buddha, Nagarjuna, Lama Tsongkhapa and all the other great enlightened beings have explained the complete path and that there’s no inherently existent I—there’s no real I, in the sense existing from its own side, there’s no such thing; that such a thing is totally non-existent; that I is totally non-existent, empty, right there, from where it is appearing, from where it is appearing as a real one, existing from its own side, it is totally non-existent; it is totally non-existent right there, totally empty right there — even though all those great enlightened beings explained that by analyzing you cannot find that I, it is totally empty, still you cannot see, cannot realize, the truth of this. Even though that’s the reality, your mind cannot see it; you are unable to see that is totally empty. Similarly, all these sense objects do not have the slightest even atom of inherent existence either. They, too, are totally empty. But you cannot see even that emptiness. Even though all causative phenomena are in the nature of impermanence, they do not last for even a minute or a second, are in a constant state of decay, you cannot see or realize them as such. You are so obscured that you cannot see what’s going to happen tomorrow, in an hour’s time hour, even in a minute’s time. With respect to such things, your mind is totally dark. Anyway, your mind is heavily obscured. There are numberless phenomena that exist but you can’t see. Therefore, all the buddhas’ holy mind, the absolute guru, bound with infinite compassion that embraces you and all other sentient beings, manifests in an ordinary aspect, which by definition has delusions, a suffering body, mistaken actions and so forth. The Dharmakaya manifests like this and through this aspect gives commentaries, oral transmissions, vows — pratimoksha, bodhisattva and tantric — initiations and tantric teachings. In Tibet, we used to say that if you are learning the alphabet order to study Dharma, the person who teaches you the alphabet is also a guru, a manifestation of the Dharmakaya. Even one verse of oral transmission, one stanza of teaching, can definitely brings you to enlightenment. By leaving a positive imprint, it can cause you to understand the teachings and realize the aspect of the path it contains; that verse can cease certain defilements and bring you to enlightenment. That one verse of oral transmission given by that guru definitely brings you to enlightenment. Therefore, there’s no question that other, more extensive teachings do so too. Therefore, the meditation to do at this point is to think, “If these are not the actions of Buddha, guiding me to enlightenment, then there’s no other action I could point to as that of Buddha liberating me from suffering and bringing me to enlightenment. So, these are definitely Buddha’s activities; activities of the Dharmakaya.” This is one reason to use in meditation, to realize that these actions are those of the Buddha; for you to realize from your own side, from the side of the disciple, that these are Buddha’s actions. Also think, “If any of these gurus are not Buddha, because I see them as ordinary, because I see faults in them” —you might see small faults in some and great faults in others, but you see faults in all of them — “Then, if none of these gurus are buddha, if they are ordinary beings, if these are ordinary beings who are bringing me to enlightenment, what are the buddhas doing? They’re not doing anything; the buddhas are just keeping quiet. The buddhas not doing anything for me but these ordinary beings are being so beneficial by doing all these activities, such as giving teachings, vows and so forth, all those things that definitely bring me to enlightenment. These ordinary beings are bringing me to enlightenment but the buddhas are doing nothing to bring me to enlightenment.” That’s the conclusion you have to come to. Then you make the mistake of thinking, “What’s up with the buddhas? What’s wrong with them? If none of these teachers are buddha and their activities are not buddha activities, what’s happened to the buddhas? They don’t have omniscient mind? They don’t have the perfect power to bring me to enlightenment? They don’t have compassion?” This is the way to meditate and analyze. In this way, you actually come to the conclusion that every one of your gurus is buddha. From your own side, you make that determination. Appearing in the aspect of having faults is the only way my gurus, all buddhas, can communicate with me. This is the only way that I can communicate with them. So, they are extremely kind to me, manifesting in this aspect of having faults. This is Lama Tsongkhapa’s technique, where you use even the faults you see in your guru to develop guru devotion. You look at your guru as buddha and you see your guru as buddha. Pabongka Rinpoche refers to this special technique of Lama Tsongkhapa in his extensive commentary on guru devotion, where you not only reflect on the qualities of the guru to develop guru devotion, the root of path to enlightenment, but also use the faults you see in the guru to develop your mind in guru devotion and receive the blessings of guru devotion. The blessings you receive help you gain realizations of the path to enlightenment. One lama said in his teachings, “Until you are free of defilements and negative karma, even if all the buddhas were to descend directly in front of you, you will not have the fortune to see the supreme holy body adorned the holy signs and exemplifications; you will have only your present view.” “Present view,” or perception, means the view that comes from your ordinary, impure mind. The logic here is illustrated by the story of Devadatta (Legpa’i Karma), Buddha’s disciple, who served Guru Shakyamuni Buddha for twenty-two years. Despite helping Buddha for twenty-two years, he never saw Shakyamuni Buddha as Buddha; he never looked at him from the side of his qualities. He always saw Buddha as a liar, he saw him only as having faults. Because Devadatta didn’t have an omniscient mind or clairvoyance, whenever Lord Buddha would make prophesies, he’d think he was lying. Once, when the Buddha was on his alms round, one girl out food in his begging bowl and the Buddha predicted, “Due to the karma of this offering, in future you will become such and such Buddha.” I’m not sure which buddha was predicted, but one of the thousand buddhas of this fortunate age. But Devadatta thought Lord Buddha was making a huge deal out of this little offering and praising her with some kind of ulterior motivation. But this was Lord Buddha often did, because he had an omniscient mind and could see even the far-distant future results of karma. But Devadatta didn’t know that and for all the years he served him, didn’t see any good qualities and simply labeled Lord Buddha a liar. Even though Lord Buddha was enlightened inconceivable eons ago, Devadatta didn’t see him as an enlightened being, only an ordinary being riddled with faults. The reason that Lama Tsong Khapa stresses great effort is that seeing the guru as buddha doesn’t come from side of the object, the guru; it has to come from your own mind, and that takes great effort. Or alternatively, a deliberate manifestation. As it says, the faults you see are either a projection of your own ordinary, mistaken mind or intentional manifestations for the benefit of yourself and other sentient beings. So, that’s another way to think; that your gurus manifest faults on purpose. So, now, after this lengthy explanation, this is where you bring in those other gurus who practice the protector; then it’s easy to understand. One way—it’s the view of your mistaken mind—one way to think is like that. The other way to think is that they have purposely manifested in that way, showing faults, because it’s the only way they can communicate with you, guide you to enlightenment. So you can think either way. Therefore, if you think like this, you’ll have no problem. You don’t have to criticize the gurus with whom you already have a Dharma connection and who practice the protector. In this way you’ll avoid conflict in your mind and will protect yourself from destroying your devotion. This entry was posted on Friday, March 19th, 2010 at 1:41 pm	and is filed under Dharma Readings. You can follow any responses to this entry through the RSS 2.0 feed. You can leave a response, or trackback from your own site. It’s important to think that the guru’s actions are pure. The “faults” we perceive are the guru’s skillful means to guide us out of samsara. I agree completely with Lama Zopa Rinpoche. His Eminence has skilfully given us the Lamrim teachings in this short article. And his advice to students to not criticize their gurus who practice the Proctector is sound.